So we’re courtside when LeBron get a f— ring/ Yeah, I bet I be there / I be there. A man of his word, Drake was in fact present in 2013 at Miami’s American Airlines Arena when LeBron James captured his second ring with the Heat, beating the San Antonio Spurs in a dramatic Game 7. Whether Drake was actually there with someone else’s girlfriend, as the song alludes, is a discussion for another time. But the line is powerful because sitting courtside for a LeBron game, especially a championship game, is as big a status symbol as there is in all of sports. How does he do, though, as a player when Drake and other big stars are courtside? Does the je ne sais quoi of being courtside, so central to the allure of the NBA, affect James’ stat line? Actually, it kind of does. This is relevant because the league flaunts courtside culture — especially during the Cavaliers’ annual two-night Hollywood extravaganza. It kicks off in a few hours with the Clippers playing host, and then on Sunday with Lonzo Ball and the Lakers (both part of a six-game road swing). With both games televised and taking place at Staples Center, where he captured his third All-Star Game MVP last month, chances are more than a handful of stars will be courtside for The King’s annual Tinseltown pilgrimage. LeBron’s love for music and music’s love for him is a well-documented two-way street. But how does ’Bron hold up when his most famous musical fans are in attendance? By cross-referencing photo archives and box scores, what we have here is a very unofficial representation of LeBron’s performances when Beyoncé, Jay-Z, Diddy, Rihanna, Drake and Usher (and their combined 62 Grammys) pull up on him at his places of business. It’s good to be The King. And apparently, it’s just as good to watch him — up close and personal. Rapper Jay-Z and Beyonce look over at LeBron James #6 of the Miami Heat and the Eastern Conference during the 2013 NBA All-Star game at the Toyota Center on February 17, 2013 in Houston, Texas. Beyoncé and Jay-Z attend a lot of games together, but it was more revealing to break the stats down separately — especially as Jay-Z attended some of his games solo. The 11-6 record is slightly misleading, as five of those six losses came early in LeBron’s career. LeBron has actually won nine of his last 10 games with Blue, Sir and Rumi’s mom courtside. There’s the 49-point masterpiece he unleashed on Brooklyn in the conference semifinals that she witnessed firsthand, husband by her side, on May 12, 2014 (only hours after footage was released of the now-infamous elevator scene). There was the royal meeting seven months later when she and Jay-Z again visited the Barclays Center to watch ’Bron (who’d returned to Cleveland earlier that summer), along with Prince William and his wife, Kate Middleton, Duchess of Cambridge, nearby. And the aforementioned decisive Game 6 win over the Warriors in the 2016 Finals. All jokes and tinfoil hat conspiracies aside, one thing’s for sure and two things for certain. The King, at least as the past decade has shown, nearly always puts on a show and walks away victorious when The Queen is nearby. Rumors of an On The Run 2 tour with Beyoncé and Jay surfaced this week. Just judging by the Cavs’ erratic play pretty much all season long (aside from an early winning streak), ’Bron might want to persuade the couple to hold off on the running until the summer. LeBron James #23 of the Cleveland Cavaliers shakes hands with Jay-Z during the game against the Brooklyn Nets on December 8, 2014 at the Barclays Center in the Brooklyn borough of New York City. 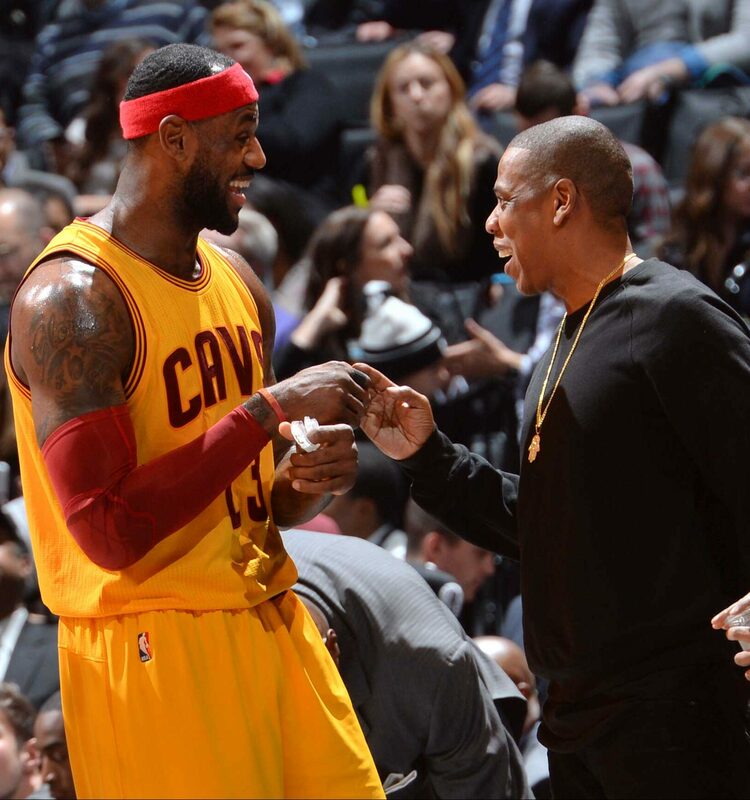 JAY-Z is the celebrity who has been linked to LeBron James for the longest length of time. The two are so close Jigga once recorded a diss song on ‘Bron’s behalf—aimed at DeShawn Stevenson and Soulja Boy during a 2008 playoff series versus the Washington Wizards. We first learned of their friendship when James visited (but never played at) Rucker Park in 2003 as a guest of Jay’s Reebok-sponsored team at the Entertainers Basketball Classic (EBC). The championship game against Fat Joe’s Terror Squad team actually never happened due to a blackout in New York City. The infamous moment became fodder for the 2004 smash record “Lean Back.” Dating back even further, an 18-year-old pre-draft LeBron allowed ESPN’s The Life into his Hummer as he rapped, word for word, JAY-Z’s “The Ruler’s Back.” Jay-Z also attended LeBron’s first home opener in November 2003, a loss against fellow rookie Carmelo Anthony and the Denver Nuggets. In his 2001 Blueprint manifesto “Breathe Easy” Jay-Z raps that he [led] the league in at least six statistical categories / best flow, most consistent, realest stories, most charisma / I set the most trends and my interviews are hotter … Holla! A decade and a half later, add a likely seventh: Most LeBron Games Attended by an MC. 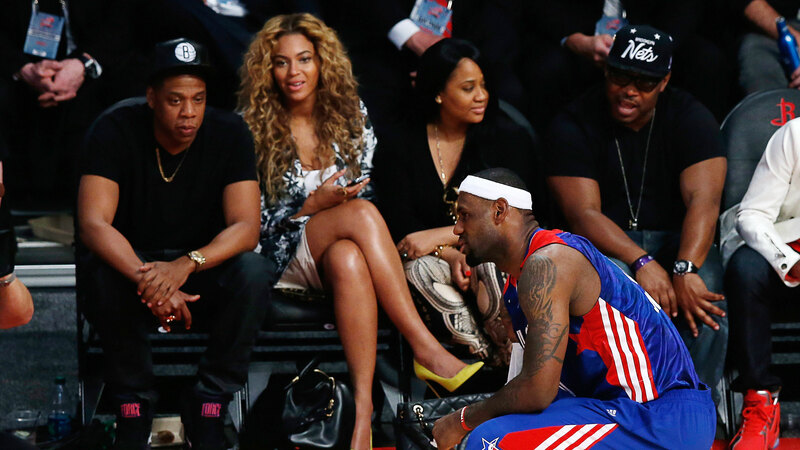 As with LeBron when Beyoncé attends, the majority of the losses Jay-Z witnessed came early in James’ career, as he lost five of the first seven. But since the start of the 2008-09 season, LeBron is 12-2 in 14 games with Jay nearby. And Jay-Z has been on hand for several LeBron classics, including two 50-point games at Madison Square Garden and a mammoth 37-14-12 triple-double in Game 5 of the 2009 Eastern Conference finals (a series LeBron and the Cavs lost in six). Interestingly enough, both Jay-Z and Bey were at Game 3 of the 2010 Eastern Conference semifinals on the road against the Boston Celtics. That was the last game that James won as a member of the Cavaliers until his return in 2014. 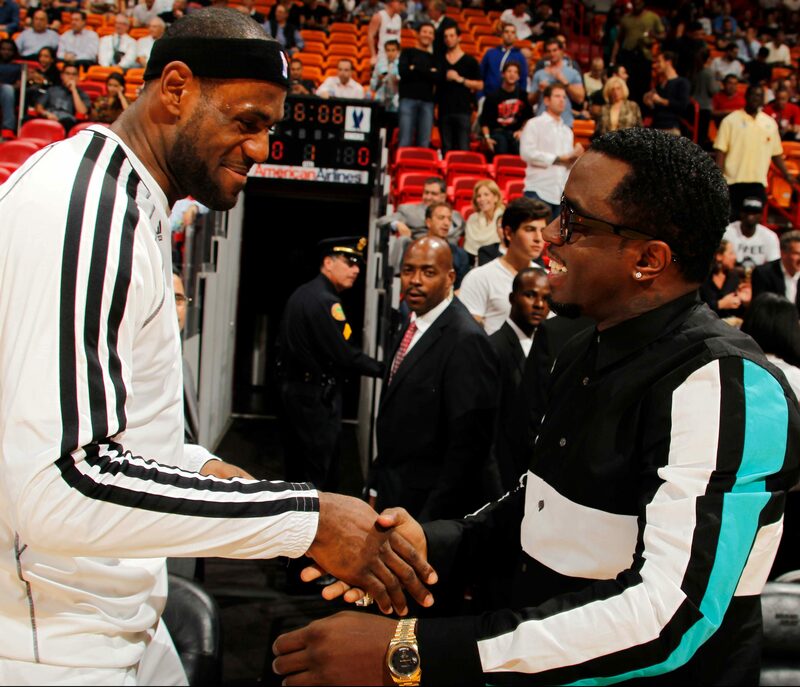 LeBron James #6 of the Miami Heat speaks with Recording Artist Sean P. Diddy Combs prior to the New York Knicks , Miami heat game on December 6, 2012 at American Airlines Arena in Miami, Florida. If I were a once-a-century basketball player with a flair for the dramatic, it’s difficult to imagine a celebrity more fun before whom to put on a light show than Sean Combs. Barack and Michelle Obama, maybe? Maybe. Diddy has never not been on the pop cultural scene since he became a household name in the early ’90s jump-starting artists like Jodeci and Mary J. Blige (and, of course, The Notorious B.I.G. — who was tragically murdered 21 years ago today). So it seems odd the Bad Boy Records founder hasn’t been to more LeBron games. Although King James lost the last two games that Diddy attended, LeBron absolutely puts on a show in front of the man who invented the remix. Yes, it’s the smallest sample size, but James averages the most points in front of Puffy, a man no stranger to putting numbers on the board himself. Diddy was in attendance on James’ legendary night in Madison Square Garden nine years ago, only 48 hours after Kobe Bryant’s 61-point masterpiece, when The King set one of the gaudiest stat lines of his career: 52 points, 9 rebounds and 11 assists. But really, the whole evening was only a subplot for the real story: One of the all-time great memes was born that night — and even if by proxy, we have LeBron to thank. 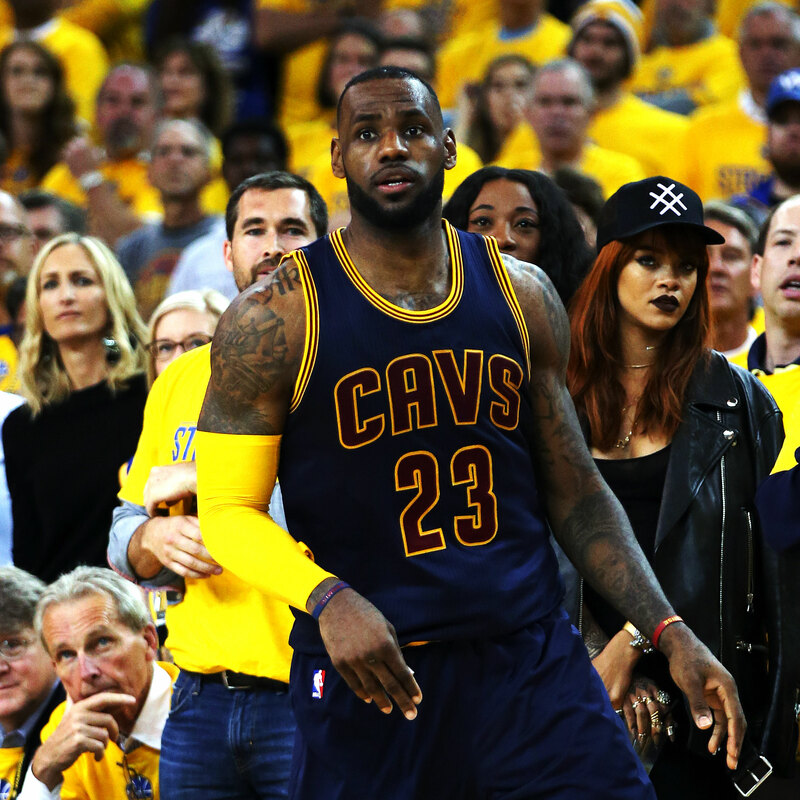 Rihanna watches as LeBron James #23 of the Cleveland Cavaliers plays against the Golden State Warriors during Game One of the 2015 NBA Finals at ORACLE Arena on June 4, 2015 in Oakland, California. I went back and verified these numbers at least five times. The math just wasn’t adding up. And, to be honest, it’s still not. For one, Rihanna, the most famous King James celebrity superfan on the planet, had to have sat courtside at more than nine games. Then again, it’s not like Rihanna’s work ethic doesn’t put her on the same plateau as James — so maybe it’s due to scheduling conflicts? There’s no way The Bad Girl sports a sub-.500 LeBron record. But that’s what the archives reveal. The last two games she attended were the Game 1s of the 2015 and 2017 Finals. The former was an Oakland thriller soured by Kyrie Irving’s series-ending knee injury. The latter was also in the Bay, but new to the scene was a (near) 7-foot pterodactyl named Kevin Durant — with whom RiRi engaged in some in-game banter. The 2017 battle has also since become known as “The Jeff Van Gundy Goes Rogue” game, thanks to Rihanna. She missed the 2016 Finals preparing for the international leg of her ANTI tour. Photo archives show she hasn’t attended a Cavs game this season, although she may be saving her mojo to right the wrongs of playoffs past. She has, however, name-dropped The King in her and N.E.R.D.’s recent “Lemon”: The truck behind me got arms / Yeah, longer than LeBron. So, yes, the support very much remains. Drake talks to LeBron James #23 of the Cleveland Cavaliers during an NBA game between the Cleveland Cavaliers and the Toronto Raptors at the Air Canada Centre on November 25, 2015 in Toronto, Ontario, Canada. They’ve partied together, worked together and made music together. Aubrey Drake Graham and LeBron James have been connected ever since Graham released the genre-bending 2009 mixtape So Far Gone. Since then, Ebony and half-Ivory are lightning rods in a pop culture universe in which both are kings of their crafts. Given Drake’s love of basketball, and the seemingly endless LeBron mentions in his catalog, 18 games feels like a lowball, although Drake has been courtside for two games that altered the narrative of James’ career: the aforementioned 37 points and 12 rebounds in Game 7 vs. the Spurs in 2013 and the robust 41-16-7-3-3 he unleashed on the Warriors in Game 5 of the 2016 Finals, a win that sparked the greatest comeback in NBA history. 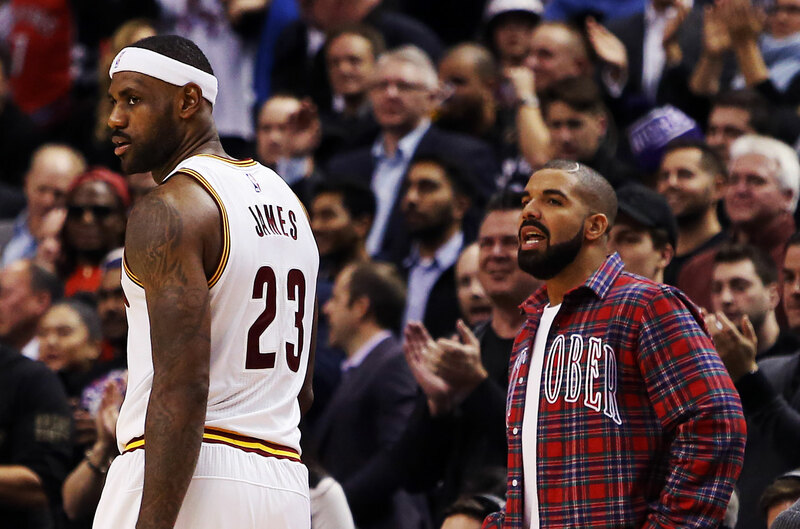 Drake and LeBron have fun at each other’s expense in the moment. During the 2016 Eastern Conference finals, Drake openly mocked the Cavs via Instagram. Of course, the trolling proved short-lived, and to be quite honest, Drizzy probably should have left ’Bron alone. By the end, all that was left was LeBron taunting Drake during a game and the Cavs advancing to their second consecutive Finals. Fast-forward a year later, after a Cavs sweep of the Raptors, James asked Drake where the margarita move was afterward. The Cavs and Raptors have played only once this season, a 34-point blowout by Toronto, and Aubrey was there to see the drubbing. The two squads square off again in Cleveland on March 21. Only “God’s Plan” knows whether the Toronto rapper/singer/actor will bring More Life to the seasonal rematch with his courtside presence. 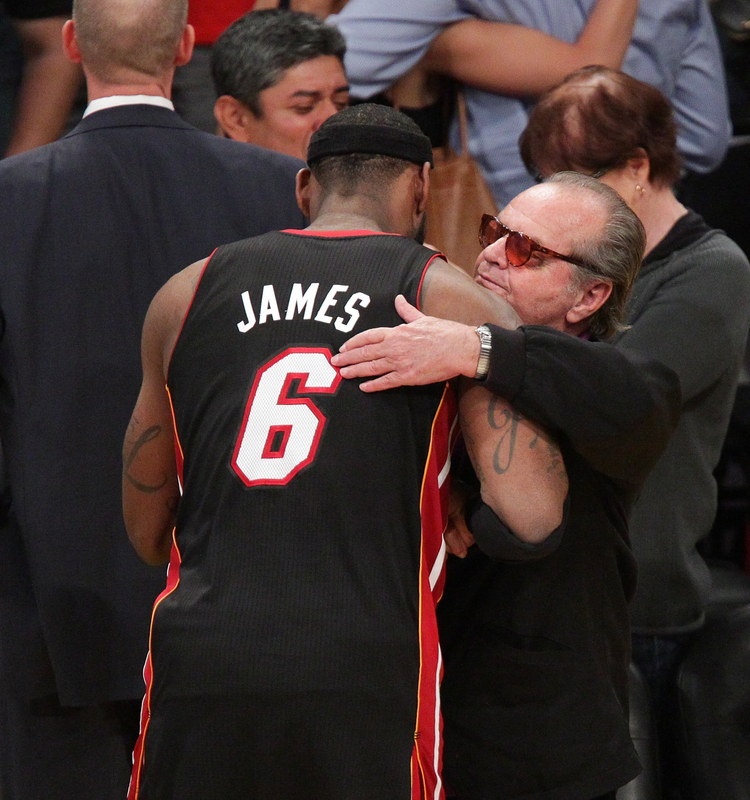 Jack Nicholson hugs LeBron James at a basketball game between the Miami Heat and the Los Angeles Lakers at Staples Center on March 4, 2012 in Los Angeles, California. You’d think Nicholson—the West Coast equivalent of Spike Lee at Madison Square Garden —would be at every game, but alas. And here’s the thing, if you’re a faithful Lakers fan making preparations for The Great LeBron Chase of Summer 2018, you absolutely need Jack. Of everyone on this list, LeBron has the highest winning and field goal percentages in front of Nicholson. I’m pretty sure a call from him would work better than engaging in billboard warfare with Cleveland and Philadelphia. LeBron James #23 of the Cleveland Cavaliers celebrates in front of musician Usher in Game One of the Eastern Conference Semifinals against the Boston Celtics during the 2010 NBA Playoffs on May 1, 2010 at Quicken Loans Arena in Cleveland, Ohio. 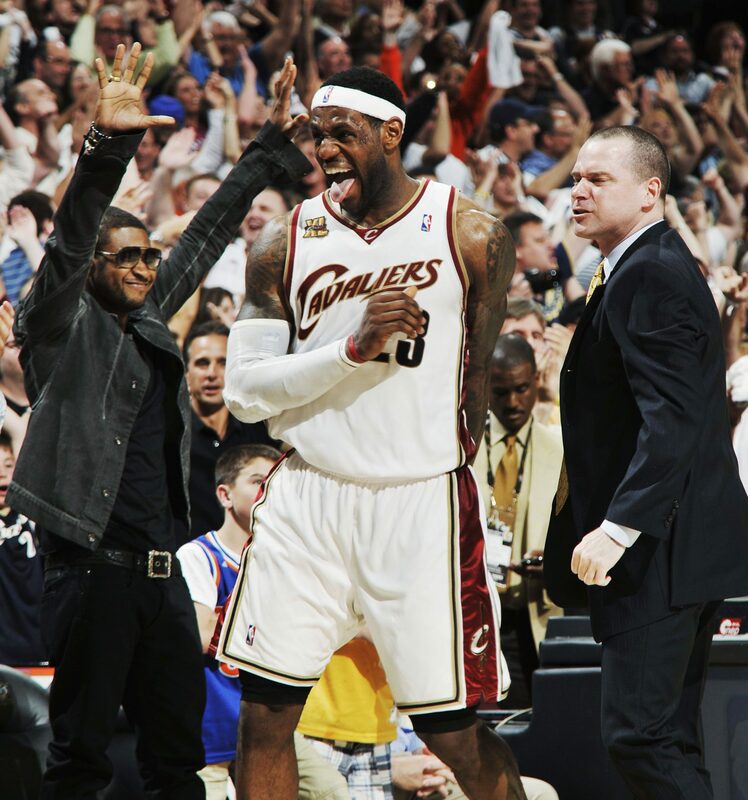 By organization hierarchy, Usher has technically been LeBron’s boss for nearly a decade. The man who gave the world the greatest back-to-back album rollout in R&B history with 2001’s 8701 and then his magnum opus, 2004’s Confessions, became a minority owner of the Cavaliers in 2005. Usher’s been present for a handful of dynamic LeBron performances: 47 points against Dwyane Wade, Shaquille O’Neal and the Heat in 2006; the infamous “crab dribble” game in Washington that same year; the game-winning 3 against Orlando in the 2009 Eastern Conference finals; and the signature defensive play of ’Bron’s lifetime, aka “LeBlock” in Game 7 of the 2016 Finals. Unexplainably true, though, is LeBron’s field goal percentage with Usher courtside. It’s way lower in comparison to the other five. At 43.7 percent, the next closest is with Jay-Z present, at 49.2 percent. However many times I looked at the games, stats and factors involved (road games, playoffs, defensive matchups, etc.) there’s no other reason than the fact someone had to be the odd A-lister out — though Raymond is the only one on this list who can say they won a ring with LeBron.